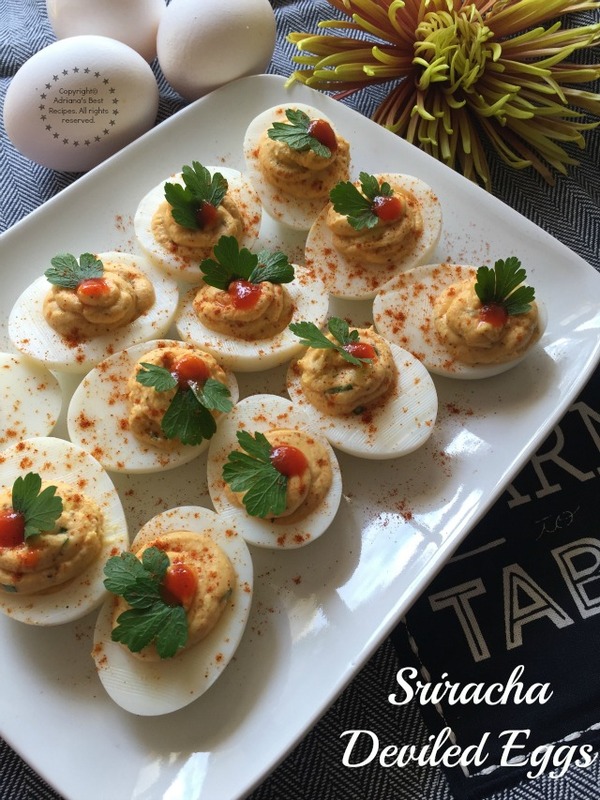 Recreating a Southern favorite, making Sriracha Deviled Eggs perfect for entertaining at home or to take along to potlucks and parties. 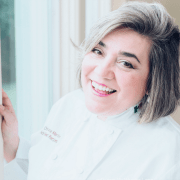 A super easy recipe! 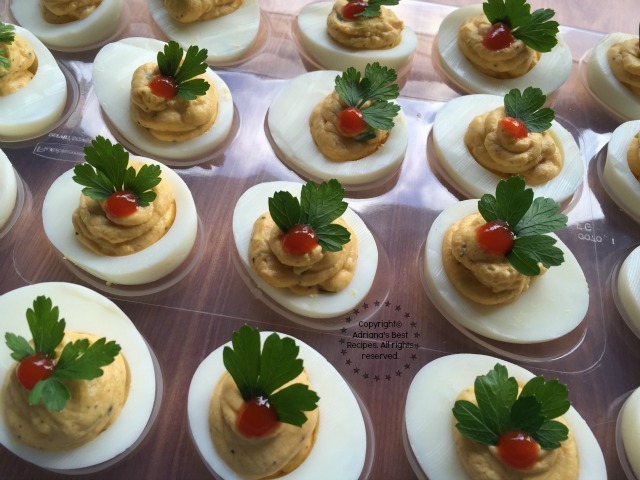 It is always nice to have easy ideas for serving appetizers when entertaining at home or when bringing tasty bites to a holiday potluck so I decided to recreate a Southern favorite and made Sriracha Deviled Eggs. 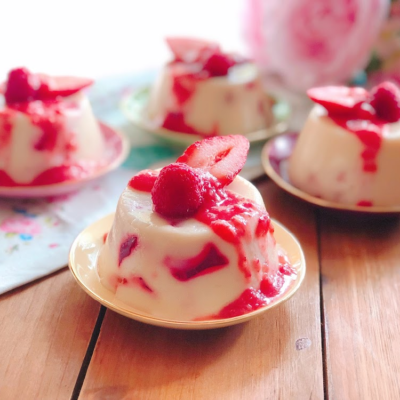 Super easy to make and so good! Deviled eggs without a doubt a Southern cuisine staple; the traditional recipe has mayo, cooked eggs yolks, sweet pickles, pimentos and salt and pepper. You can take this as a base to create many flavors and that is how I came with the idea of making Sriracha Deviled Eggs replacing the sweet pickles with mustard and the pimentos with sriracha. 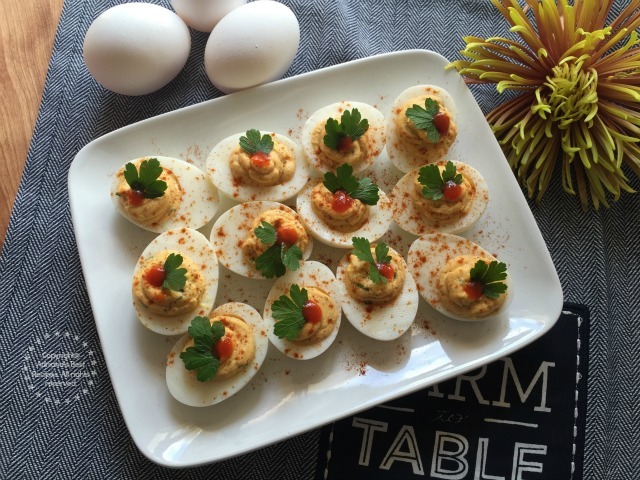 Recreating a Southern favorite, making Sriracha Deviled Eggs perfect for entertaining at home or to take along to potlucks and parties. A super easy recipe. 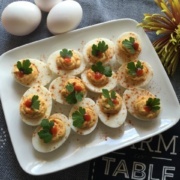 It is always nice to have easy ideas for serving appetizers when entertaining at home or when bringing tasty bites to a holiday potluck so I decided to recreate a Southern favorite and made Sriracha Deviled Eggs. Super easy to make and so good! Remove the cooked yolk of each egg and place in a bowl. With a fork mash the yolks and then add the thyme and the chives. Add the mayo, the mustard, the sriracha sauce and season with salt and pepper to taste and mix well. Scoop the mix into a plastic bag, seal and cut one of the ends. Pipe the mix into each of the egg white halves. Garnish with parsley leaves, a dot of sriracha sauce. Refrigerate until ready to enjoy. Sprinkle paprika before eating for a more colorful presentation. - Keep eggs at room temperature before cooking. - Place the eggs inside a pot and top with cold water. Do not overcrowd the pot with too many eggs for better results use a bigger pot and add more cold water. - Cook on high heat and bring the water to a full rolling boil. Then turn off the heat, cover, and let sit for 10-12 minutes. After that time eggs will be cooked. - Strain out the hot water from the pot and run cold water over the eggs to cool them. That will stop them from cooking further and get over-cooked. - You can also cook the eggs using the sous vide technique at a 165°F temperature for 2-3 hours to get a non rubbery white. You can also add a twill of bacon or decorate with green olives and even replace the mayo with avocado. 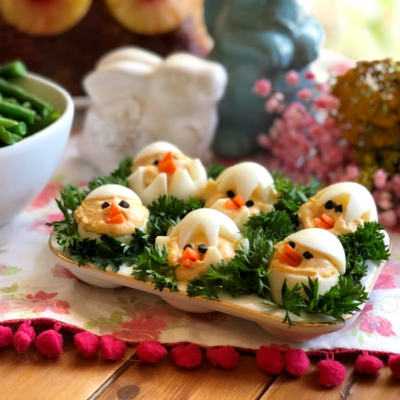 Deviled eggs are such a flexible recipe, you can become very creative when recreating your own deviled eggs recipe until you decide which is the winning combination. 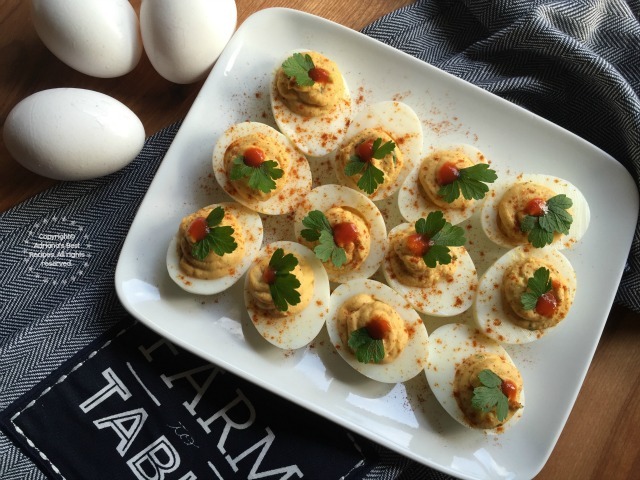 This Sriracha Deviled Eggs recipe is using farm eggs from a local farm I visit near my home. I truly believe it is a good thing to support your local farmer and to use what is available fresh locally. As a precaution, I like to clean the farm eggs with running water and soap before using to remove any debris since you never know if those could have residue from the chicken coop. Keep eggs at room temperature before cooking. Place the eggs inside a pot and top with cold water. Do not overcrowd the pot with too many eggs for better results use a bigger pot and add more cold water. Cook on high heat and bring the water to a full rolling boil. Then turn off the heat, cover, and let sit for 10-12 minutes. After that time eggs will be cooked. Strain out the hot water from the pot and run cold water over the eggs to cool them. That will stop them from cooking further and get over-cooked. You can also cook the eggs using the sous vide technique at a 165°F temperature for 2-3 hours to get a non rubbery white. 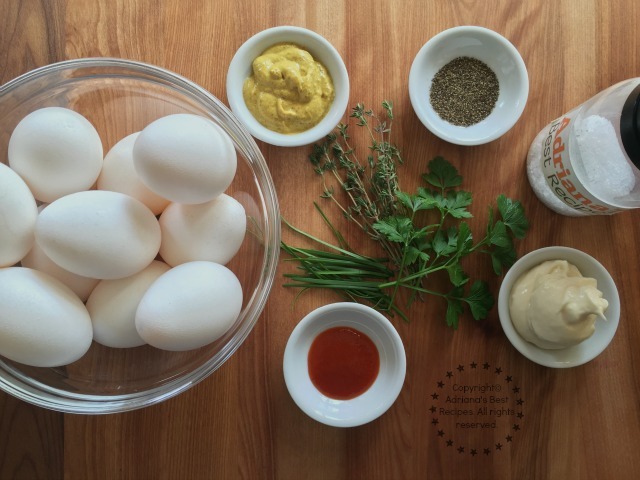 My recipe for Sriracha Deviled Eggs is perfect as a take along for parties and potlucks. 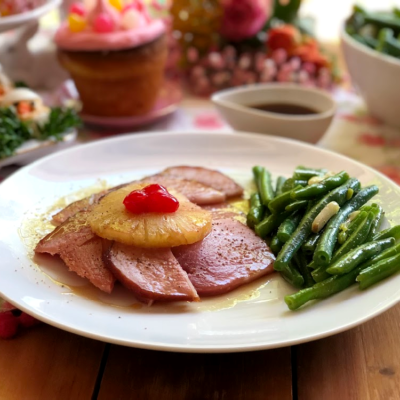 I invite you to try this recipe and make it your own. Deviled eggs are always a hit. I love that you added delicious spice to them. 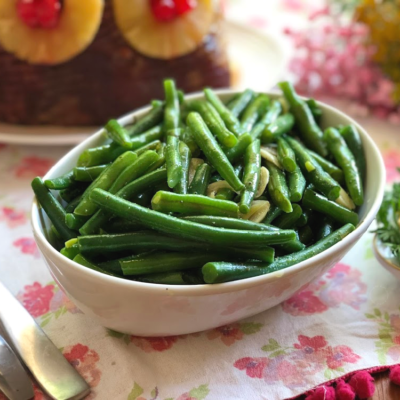 Deviled eggs disappear so quickly at our family dinners, these sound really good! 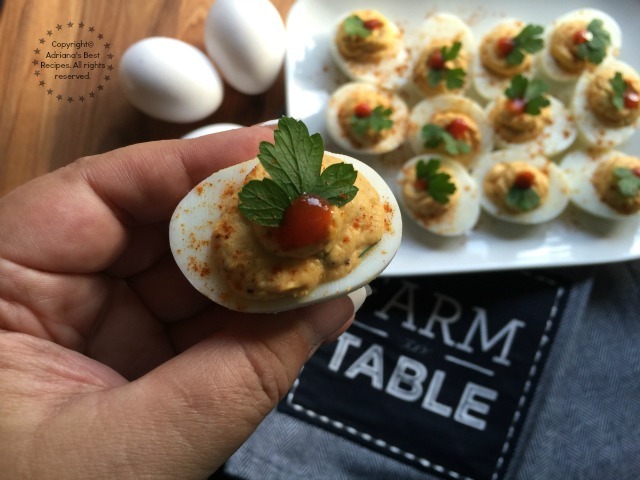 These would be such a hit in my house – I love deviled eggs and my hubby loves sriracha, so we’d both go crazy for these! I love deviled eggs. They always disappear too quickly at our family feasts. I love how festive yours look with the red sriracha and green parsley garnish. These look so pretty and yummy! Love the touch of red and green for Christmas!!! OMG, these look so good! My deviled eggs never come out this pretty. 🙂 Thanks for the recipe amiga! I think I might be the only one who hasn’t tried Sriracha. It looks like it would add quite the punch to it. Deviled eggs are my favourite! Que delicia y novedosa receta. Me encantó! This looks wonderful!! I love the combination, I can’t wait to make this recipe. Thank you for the idea. I’ve never done Devil eggs before. Your recipe looks easy and the pictures are making me want to make them soon. Que rica adición a la receta. Me diste una buena idea para las fiestas. these look amazing. My whole family loves deviled eggs so I’ll have to try this. Que buena idea para llevar a una cena! 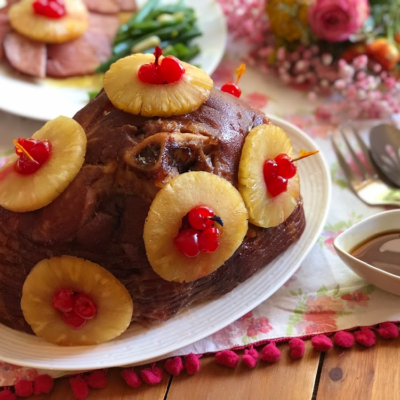 Está maravilloso esto para las fiestas; este año quiero variar un poco y esta receta está espectacular, gracias ! I can taste these through the screen! They look gorgeous!! !